Fully licensed by the UK Gambling Commission (for customers in UK). Very popular company (270+ staff) trusted by players since 2013. Large selection of games and syndicates to choose from. Audited by KPMG & highly rated by TrustPilot. LottoLand originally took the UK by storm, but have now grown throughout Europe and Australia too. The company itself was created around bets on lotteries online from all over the world. 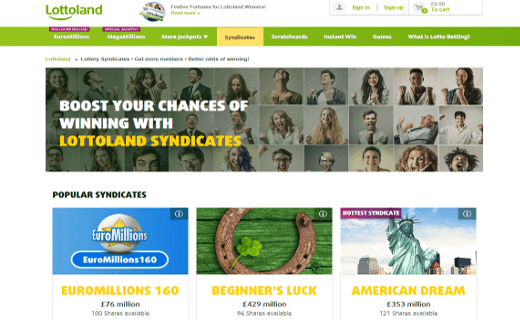 It started in May 2013, but the LottoLand syndicates are a much more recent idea. It does however mean that playing with LottoLand means you're dealing with a well established company. They have grown dramatically in just a few short years, and now have a staff of over 270 employees. The company are based at their main offices in Gibraltar - fast becoming the home of the online gaming industry (and a British colony on the southern coast of Spain for those that aren't already aware). You get some choice here, not only which game but also the group size too. One of our regular criticisms, and a tricky thing to get right, is the balance of group size versus jackpot size. Here you should be able to find a combination that works for you. And I'm pleased to say the value for money is really good. The prices start from just €5 per syndicate share. The games available for group play do change over time, but currently include Irish Lotto, Millionaire, US Powerball and US MegaMillions. There have previously been options for EuroJackpot, Italy's SuperEnaLotto, French Lotto and Polish Lotto as well as most of the Australian games too. For the more popular games, namely US Powerball, US MegaMillions and Irish Lotto there are syndicates of different sizes too - playing anywhere up to 1,000 combinations. 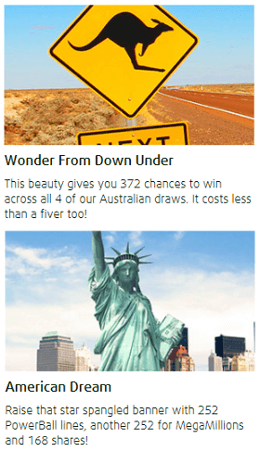 So you can share in the winnings of anywhere from 252 combinations right up to 1008. And none with a group size any bigger than 156 (on a lot of rollover weeks that's still 156 multi-millionaires). The less popular games have previously been available in a variety of 'blended groups'. Such as the Wonder From Down Under syndicate which covered all 4 Australian games. Or there was Lucky 7's, which not surprisingly plays 7 different games with a total of 777 lines played. And American Dream which covered the 2 mega games from the USA. Can You Buy Multiple Shares? You can take up multiple positions in a syndicate group. There's no limit on this, so you can actually buy up as much of the group as you want. There isn't however an easy way to join multiple different groups for the same game. So you can't buy a share in two different Powerball250 groups at the same time (i.e. to play two different sets of combinations). There are two ways around this though. Because you CAN see the numbers that your group will be playing BEFORE you buy them. To see the numbers your group will be using. First add your chosen syndicate to the shopping cart. Then click that syndicate in your cart. This will open up more information showing playslips of the combinations you would be buying a share of (more on how numbers are picked below). So you can buy one syndicate one day, then wait a day or two, and buy another syndicate. If enough positions have been sold you should see different numbers. The downside of this is the risk of forgetting to buy the next one in time! The easy way to get different sets of numbers though is to simply buy a different syndicate size. So you can buy a Powerball250 and a Powerball500 entry at the same time, and get completely different numbers. For some reason LottoLand do not offer long term subscriptions for syndicates. That may be something to come in future, as you can subscribe up to 52 weeks in advance with their non-syndicate options. But for syndicates you currently have the option of 1, 2, 4 or 8 weeks at a time. This does however make it ideal for those who want to play as and when they like, e.g. big entries once a month, or when jackpots are big. (I recommend opening an account before you want to play though so you know you are to ready to go for the draws when you do want to play). SIDENOTE: Incidentally, their regular game options have two awesome extra features I'd love to see added to the syndicates. The first is called Jackpot Hunt - which basically means 'keep playing for me until the jackpot gets won' (brilliant for games that can rollover a lot). The second lets you set an option to only bet when the jackpot is bigger than a certain size. This works together with all the other options so you can pick your game, which days and your combinations - then say only bet when the jackpot is over €100 Million. Genius. I think it would be too complex for LottoLand to add these options for the syndicates too, but you never know and it's nice to know they are there if you want to use your own numbers. Numbers themselves are chosen randomly, but are organised into system plays (or wheels). The type of wheel and how many of them are used depends on how many combinations the group is playing. Full wheels are being used rather than reduced wheels. Which means every possible combination of the numbers you see on the playslip are covered. The choice of payments is really good, with all the usual Visa and Mastercard options. There is also Neteller, Skrill and Paysafecard as alternative options. You can also add a credit balance to your account rather than keep paying from your card every time. Which I find a really useful feature. Paying this way also adds the extra option of paying by bank transfer too. TIP: LottoLand don't make a big thing of it, but if you credit your account using bank transfer (over a certain amount - check the latest amount in their FAQ before you credit) you also get a Top-Up Bonus of 3%. It's their way of passing on what they save in card processing fees, and I applaud them for that. No, it's not huge, but it's a little bonus you don't get if you just pay by card each time. Wins are credited to your LottoLand account as you go, and can then be withdrawn whenever you like. This is easily done online. You get an email after each draw to confirm winnings, and you can then also see all your wins in your account under 'My Transactions'. You can withdraw your winnings back to any bank card you have previously paid with. Or straight to your bank account if you prefer. You can also use your winnings to play again if you like instead of withdrawing them. For large wins I'd suggest withdrawing to your bank account. Any Big Winners So Far? There have already been some really nice wins with LottoLand - and some of these have been featured very prominently in the news. The largest winner so far is Matthias from Berlin, Germany. He won €22 Million in April 2016. But there plenty of other big winners too. For the El Gordo draw for 22nd December 2016 one player in the UK won £421,004. Another group of 5 people shared £2.8 Million for the very same draw. Another player won £1.8 million betting on the Polish Lotto (Chris Tarrant awarded him his winners cheque in London). You can read more about the big LottoLand winners here. Is LottoLand Safe To Play? But they also have a very high rating with TrustPilot at 8.1 out of 10 (at the time of writing). That's far from easy to do, given that even Google scores only 6.3, and Apple (yes, that Apple) currently scores 3.8! They've been around since May 2013, have over 270 staff. And they are regularly audited by the highly respected auditors KPMG. Once you have joined LottoLand do keep an eye out for their special offers. They have regular specials such as '2 For 1' offers (double your chance of winning!). There are also some great extra promo codes for new players - free entries plus money back offers if you don't win etc. Check out the latest offers here. What Do We Think? Is LottoLand Any Good? I have to say I'm impressed with what LottoLand have put together for their syndicates. There are a couple of minor niggles - such as not being able to join multiple groups at the same time, or subscribe for longer periods of time. But these are very minor compared to the overall quality. The value for money is very good. They have good syndicate sizes, and numbers of combinations for the games offered. Plus loads of games to choose from. Joining a syndicate is dead easy, with lots of payment options. And withdrawing your winnings is easy too. As a final note, the company are also fully licensed in both the UK and Gibraltar, and are regularly audited by the highly respected auditors KPMG. 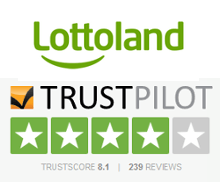 It's not hard to see why LottoLand have such a high rating on TrustPilot. This has just become one of our favourite syndicate options. 11 Jan 2017 Jack from West Midlands, UK picks up a very nice win of £421,004 betting on El Gordo, whilst a pair in Hampshire win £343,000. Read more about all the LottoLand Winners. 12 Sep 2016 Not seen the LottoLand TV Ad - enjoy. 30 Jun 2016 Here's a video of CEO Nigel Birrell interviewed at their offices in Gibraltar. 5 Jan 2016 A small syndicate group share £2.8 Million from betting on Spain's El Gordo Christmas Draw. 2 Oct 2015 Adam S. from the Midlands wins £1.8 Million betting on the Polish Lotto. PlayLottery.com Review - groups for the UK Lotto, EuroMillions and more from this well established company. You Play We Play Review - very straightforward syndicate, with a novel pay as you go option.